Want to know where your food is coming from? Do you like to enrich the earth as much as benefit from it? This local organisation has many ways to support you in such an excellent endeavour - our thanks to PNB's Committee member Fiona Moloney for her wonderful help in putting this insight together. When and Why was Permaculture Northern Beaches formed? PNB was set up 9 years ago, it is a not for profit group born out of Permaculture North mainly because interest in sustainability, the environment and food sovereignty was growing along the beaches, and we have been growing ever since. We attract a wide variety of people, those new to gardening, people who are passionate about the environment, those who want to employ chemical free practices as well as experts in gardening as well as those who want to learn how to do things a little bit differently, learn new things, and meet new people. Permaculture, the bringing together of the two words ‘permanent + agriculture’ is a term coined by Australians Bill Mollison and David Holmgren. Permaculture is a design system for creating sustainable human environments. A major focus is the sustainable and harmonious use of resources for safe food production. It is based on 12 practical and integrated design principals and methods modelled on the natural world and these principles can be applied to both urban and rural environments making them perfect for the Northern Beaches and suburban living conditions. We aim to: Educate, connect, influence and inspire, we strive to support, protect and most of all to make a difference - now isn’t that cool! Our members have access to over 50 free workshops and educational events a year, including permabees, living skills workshops, Seedsavers workshops and guest speaker events. We teach a huge range of skills in self reliance, permaculture design, teaching and community development - and we have a lot of fun doing it! PNB is committed to the principle and practice of ecological sustainability. We aim to achieve this through educating ourselves and others by sharing experience, knowledge and practical skills. Our guiding ethics are ‘Earth care, people care, fair share’. How much is membership and what would somebody joining gain? Ongoing opportunities to increase knowledge and skills e.g access to our seed saving and sharing group, keeping native bee and hives, turning your pool into a pond for urban wildlife, how to save energy and water! The teaching activities - what does this involve? We have broad range of workshops that members can attend on living skills where you will learn everything from how to make your own soaps, cleaning products, and skin care products, to composting, bee keeping, making habitats for urban wildlife, growing healing herbs, foraging for edible weeds, sustainable property practices, making worm juice and compost tea, how to make organic fertiliser, how to build a no dig garden, keeping cooks and small space gardening. We are also very proud of having some of the most amazing inspirational speakers imaginable on the subject of sustainability, environment and food production. We have a range of fact sheets and useful practical information on our website. The Permatours - what are these about ? Here we learn tips and techniques from other members, see what worked and what didn't, and get inspired with new ideas and ways of designing your garden space for maximum productivity. It's also a great way to make new friends of course. We have some really awesome events in the next few months, all are always packed with useful and empowering information! Later this month on National Sorry Day we have John Newton discussing the oldest foods on earth found right here in Australia. Last year was the first time that we held our Eco Festival in Ingleside and it was massively successful, every one had such good fun, and our second festival is at the beginning of June this year. It all about inclusion, sharing knowledge, being part of something that can make a real difference, this is a great opportunity to bring the kids along and share in a family learning and fun day out experience. We have a permabee the day before, this is when we get together to help out at and participating in something of benefit for many. At the end of June we have a movie and soup night, time for soup and a share table and learn all about food waste, this is a problem, and raising these issues is something we like to highlight, everyone learns something new. Last month we had a panel discussing the state of our oceans, most people were shocked with the information, and everyone vowed to do something to make a difference, this is the key, we can all do small things that make a massive difference, this is what’s so inspiring when like minded people come together, we feel empowered. Dates and topics for those coming up are listed below. For more detailed information people can check these on our websitewww.permaculturenorthernbeaches.org.au/events - and everyone is welcome members and non-members. European Australians have almost entirely rejected these foods for over 200 years that I wrote this book. native plants and animals that are better for the land than those from Europe. But the tide is turning. European Australians are beginning to accept and love the flavours of our own foods, everything from kangaroo to quandongs, from fresh muntries to the latest addition, the magpie goose. And working with and learning from indigenous Australians, new and sustainable industries growing these foods are taking root around the country. This is a food book that will change the way you look at Australia." Help prepare the permaculture field and land for our second annual Eco Festival. Be part of a real community spirit in the lead up to our big day on Sunday the 5th June. Enjoy working in a pesticide free area with community allotments. All welcome! Join in on ‘Permaculture Northern Beaches’ second annual Eco Festival and participate in a global celebration with your local community. World Environment Day is celebrated every year, on the 5th of June, to raise global awareness to take positive environmental action to protect nature and the planet. 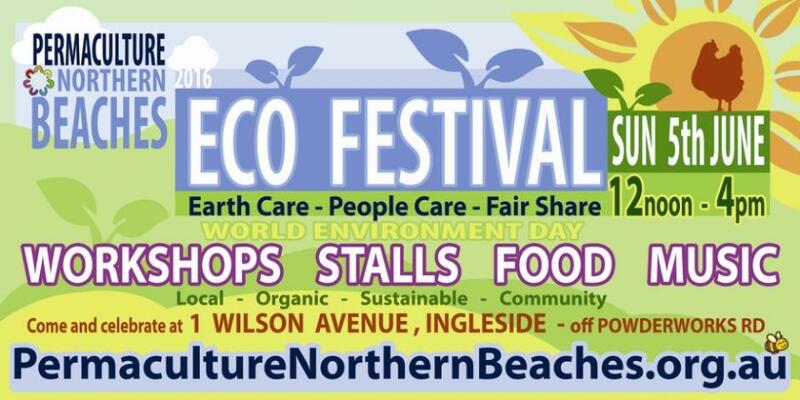 This year, join in on 'Permaculture Northern Beaches' second annual ECO FESTIVAL. Enjoy live music, interesting workshops, information stands, stalls, food, kids activities and heaps of organic fun, all on a permaculture field on Sydneys Northern Beaches. Lots more information coming soon! Entry by donation: $10 for non-members and $8 for members. Hot soup and bread, teas, and coffee available on the night. Interested in disinvestment from unsustainable industries and ethical placement of your money? Hear from our expert panel in an interactive Q&A. Pick up practical advice for your own home. Watch this space guest speakers announced soon. Did you know that we are exposed to more toxic and hazardous chemicals from using common household cleaning products inside our homes than anywhere else? These incredibly harmful chemicals are causing many illnesses for us and our families and create tons of toxic waste which is disposed into our environment. In the past 40 years, at least 70,000 new chemicals have been released into the environment through cleaning and industrial products, with a US study revealing that its participants carried an average of 43% of these chemicals in their body. Want to make sustainable, eco friendly, safe and low cost cleaning products for you home? At this workshop we will make washing powder, fabric softener, cleaning sprays and creams, toilet cleaner, air fresheners, liquid hand soaps, veggie wash and more while boosting your immune system at the same time! This two day intensive course covers topics from gardening, sustainable housing, soil, site analysis, permaculture design, and zoning. It is a great overview of what permaculture is so as to enable you to take the next steps to incorporate this into your life. You will receive an Introduction to Permaculture certificate and a copy of Bill Mollison's book " Introduction to Permaculture." The course will be at Kimbriki Eco House and Garden at Ingleside, this allows for practical exercises in the garden. The Eco Garden has an established permaculture garden, native bee hive, aquaponics, compost toilets, straw bale/hempcrete and recycled buildings. Teachers include: Peter Rutherford senior ecologist at Kimbriki and Michelle (Elle) Sheather ecologist, qualified permaculture teacher, and coordinator PNB. Special guest teacher to be announced. Please note this is the only ITP course for the remainder of 2016. What Time: 9:30am to 4:30pm both days. Cost: $290 for members, $330 for non-members, concessions available. How do people get involved with these - as members or as stall holders - what is the difference between these two? Is there anything for younger people and children? Always, children are key to this changing planet, if we can get the message through at a young age that they are responsibe for their immediate environment can you imagine the difference it would make in their years ahead, their decisions would be so much more considerate of the impact we each have, their foot print so to speak. Check out our Kids Fact Sheet on our website - we think it’s really important that people know about where their food comes from from an early age, a simple way is to grow a small garden with them, allow them to get their hands into the soil and learn how nature works beautiful and perfectly well to produce delicious food, there is nothing nicer than the taste of your own home grown foods and children are often the first to spot this. At our stalls we also have points of play with children where we encourage them to investigate the native stingless bee and learn how to grow seeds into giant sunflowers as two examples. What are NBP favourite places in Pittwater and why? Well of course we just love the community gardens, we love when people come together and eat together, how good is it to just eat as you learn, chat and have fun! We also love hanging out at Kimbrikii and at our monthly meet ups which are now held in the Nelson Heather Centre, in Warriewood. We also really enjoy when one of our members opens up their garden asking for support, that’s when we hold what we call a ‘Permabee’ a place where volunteers come together to help and learn, as you can image a great deal of work can happen in a short time when many hands are involved, it’s the old way, and some might say the best way, it’s a great way to just break away for the day to day and get your hands, knees and face dirty! What is Permaculture Northern Beaches Motto or creed? Copyright Permaculture Northern Beaches, 2016.